Revive your body with the Nesti Dante Dei Colli Fiorentini Cypress Soap, a vegetable-based cleansing bar. The aromatic bar takes you on a fragrant journey through the wild and beautiful Florentine Hills, where flowers and greenery grow in abundance beneath the clear blue sky. The regenerating properties of Cypress ensure a state of well-being for both the body and the mind, while the vegetable base works to nourish the skin whilst gently ridding it of dirt and toxins. 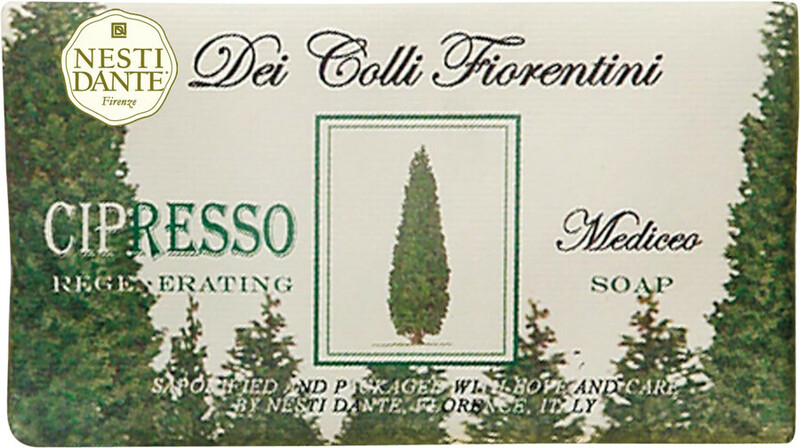 Nesti Dante Dei Colli Fiorentini Cypress Tree Soap 250g is rated 5.0 out of 5 by 5. Rated 5 out of 5 by Slimbo from Worth the extra! This is not a cheap soap. It is an expensive soap. But it is also very good soap and therefore gives loads of value for your money. The cypress aroma is subtle and lasts right through to the end of the bar, and a bar will last you a long time. At 250 gms it is heavy - drop it on your toe and you'll know about it. It's a bit bulky to hold on to so try cutting the bar in two [wrap in clingflm first to minimise waste.]. A small er bar is also available. Nesti make a huge range of soaps and Cypress is one of their best. Final tip, don't throw the wrapper away.Stick it in a clothes draw and let the aroma do its work. Great stuff! Rated 5 out of 5 by cressetmama from Great soap I was inspired to try this, and several others from the range (as yet unopened) by a Mumsnet thread, and I am so glad. Huge bars (which are easier to handle cut into two), fresh fragance and unisex appeal, they also come in rather less expensive than my husband's former soap preference. Rated 5 out of 5 by jane78 from Glorious gentle soap. This must be the loveliest soap ever, the smell redolent of a hot Mediterranean hillside clad in juniper and pine. Practically speaking, it is so economical too,and lasts for ages, with a soft comforting lather. I have been known to cut the large size in half with a cheese wire, in order to have it in more than one basin at a time. It is also a lovely present to give to someone you really like.